Kawasaki KLX250S/SF OEM Rear Tail Light & Turn Signal Connector Set. Can attach to any aftermarket rear tail light and rear turn signals to make them plug and play. 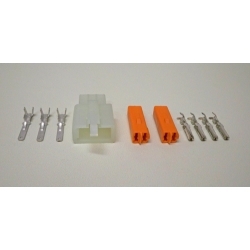 Set Includes: 1 tail light connector with pins, and 1 set of left & right rear turn signal connectors with pins.